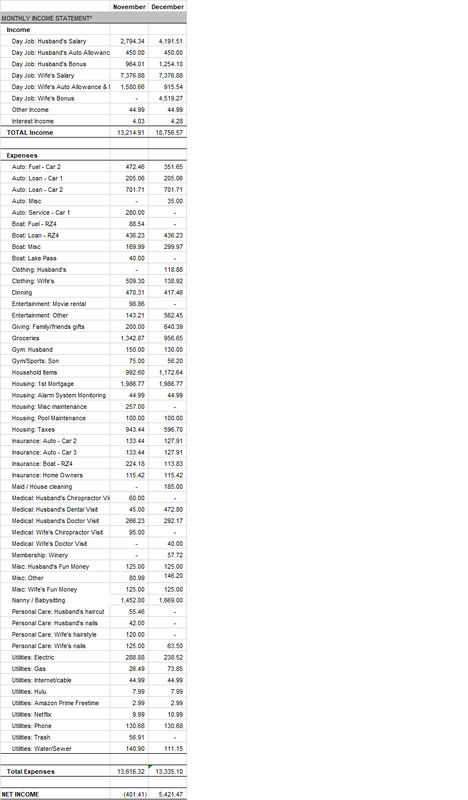 December was a terrific income month but also a high expense month (see spreadsheet screenshot). Our total income in December was $18,756.57. In addition to our regular paychecks, my wife received a quarterly bonus of 8,077.44 gross ($4,519.27 net). I received a monthly bonus of $2,222.41 gross ($1,254.10 net), and I received a 3rd “extra” paycheck. My wife received a $915.54 auto allowance / mileage reimbursement and I received a $450 auto allowance. We earned $4.28 in interest income from our savings accounts. This month, our expenses totaled $13,135.10, almost the same amount that we spent last month (and that is not good). Big ticket items include $805 in doctor/dental bills, $562 in entertainment, and $640 in gifts. Next month should be another good income month since I will receive a good quarterly bonus.